Qualifying concluded at the Boyd Tinsley Women’s Classic in Charlottesville yesterday, and the seeds better be scared. Qualifiers Storm Sanders, Nicole Frenkel, Vojislava Lukic and Elizaveta Ianchuk put in very strong performances that they hope will propel them beyond the first round. Frenkel is the lone American qualifier and she’ll be ready to jump into the Har-Tru Wild Card Challenge after her 6-2, 6-1 victory over Angelina Gabueva of Russia. Gabueva was a lucky loser, and she’ll get a chance to redeem herself in a match against the seemingly ever-vulnerable Michelle Larcher de Brito today. But today is all about the Dothan Do-Over. Wild Card challenge leaders and Dothan finalists Katerina Stewart square off today. The match is the third of the day on Stadium Court and the winner may take an upper hand in the race for the reciprocal wild card to the French Open awarded by the USTA. A Chirico loss today would certainly shake things up in the standings and put the pressure on Stewart to continue to win in Charlottesville. And there will be plenty of others on court today trying to snag wild card points. Of 11 matches today, only three won’t have an American on court. 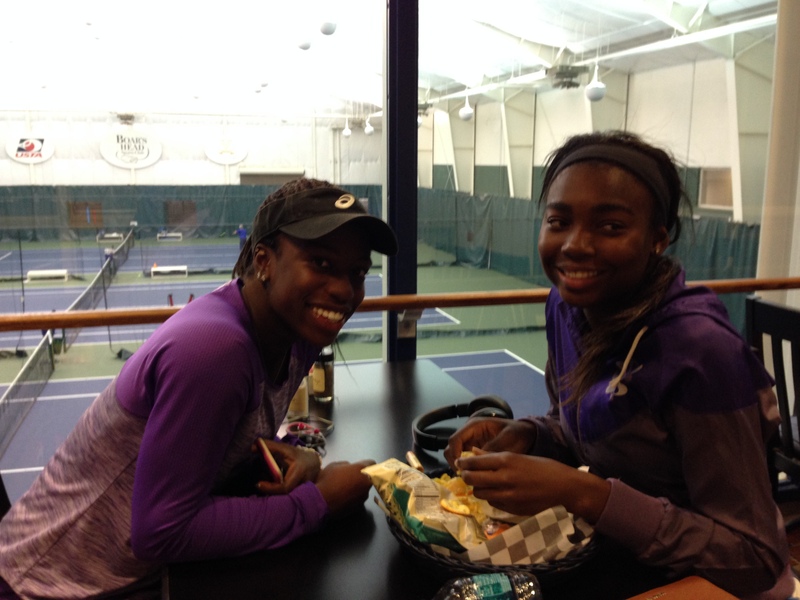 Top seed Sachia Vickery will be on Stadium Court prior to the Dothan Do-Over looking to advance past Julia Boserup. Second-seeded Grace Min will be the feature match on Court 7 against Gabriela Ce in what I call the “The Cage”. It’s the only court in Charlottesville with a tall fence in front of it, so it reminds me of going to watch a friend play at a middle-school court. And Tornado Alicia Black against Francoise Abanda? Yes, please. They kick things off on Court 1 in just a few minutes. I’ll live-tweet the Dothan Do-Over and then leave the tournament, relying on the live stream to keep me informed for the rest of the week. Whether it’s the Men’s Pro Challenger in the fall or this event in the spring, the Boar’s Head Resort is a must-see for tennis fans. Fans and bloggers are basically embedded in the café, which serves as a de facto player’s lounge so you get to watch them kill time between matches in real time. You can’t help but overhearing their jokes and stories and I promise you it’s more fun than watching paint dry. You also get an immediate sense of the real personalities of the assembled athletes. Danielle Lao has to be the happiest American on tour as she has had a permanent smile for three straight days. And I personally nominate Jennifer Elie as the funniest American on the tour. I even called her “American Petko” to her face. She had everyone in stitches joking about a certain college football standout who had been in trouble for stealing crab legs. With your laundry in your bag, and not sure where your next stop is going to be, laughter is a great medicine to get through the tour.